Porcupine Tree - "In Absentia"
Porcupine Tree albums have always taken at least a few listens to start growing on me, and In Absentia is no exception. In fact, I approached the album somewhat hesitantly (as many fans did) due to some of the big changes going on with the band. Wow, a major label deal! Would Steve Wilson's vision be compromised? What? No more of Chris Maitland's superlative drumming? Would this be the Porcupine Tree I've come to know and love, or something else? Well, first, let me say, that one of the things I have always loved about this band is the fact that they do keep growing and changing. I'm not one of those fans that wish they would do another Sky Moves Sideways (as much as I do love that album). I'm glad Wilson and company offer up new musical directions, new lyrical themes, and more astounding production techniques with each and every release. 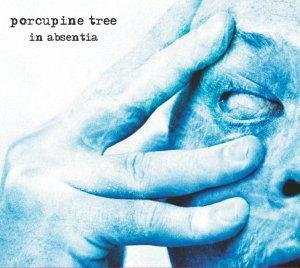 So in all that sense, In Absentia is really just the next step for Porcupine Tree. And what a great step it is! Steve Wilson continues developing his craft as a songwriter, proving that he is one of the best in the field today. But the gorgeous harmonies and catchy choruses of songs like Blackest Eyes and The Sound of Muzak belie the album's complexity and definitely darker edge. While it's not exactly a concept album, in usual PT fashion Wilson's lyrics cover interrelated themes. Many of the songs on In Absentia probe into the psyche of a serial killer, from the youthful innocence gone awry of Blackest Eyes to the illness in the family of Strip the Soul, to the melancholy confusion of Prodigal, to the downright chilling The Creator Has a Mastertape. Wilson also draws parallels to the madness of the modern world, with weapons blacking out the sky in .3, and 60-ton angels falling from it in Trains. The Sound of Muzak laments on how "one of the wonders of the world is going down", as meaningful rock gives way to music that is "only meant to repress and neutralize your brain." Musically, the band continues to evolve. Steve Wilson is definitely mastering Beach Boy Brian Wilson's concept of the "pocket symphony": a work with the complexity of a classical symphony, framed within the boundaries of a pop or rock tune. Each member of the band is up to the task, following Wilson's lead as dynamic shifts from heavy metal style power crunching to mellow outer space breaks, to folksy pop singing meld together and fit perfectly, even in the space of just one song! Across the album as a whole, there is a wide range in sound, from the darkly symphonic Gravity Eyelids, that reaches heights of Opethian heaviness, to the beautifully acoustic Trains, which has an extended break featuring banjo and handclapping! Keyboardist Richard Barbieri lends textures and tones throughout the many layers of sound, many of which only reveal themselves on repeated listening. New drummer Gavin Harrison proves himself as well, adding fiery cymbal work to The Sound of Muzak (working along nicely with Colin Edwin's always fine bass playing), and powerful rhythmic design to the excellent instrumental Wedding Nails. I won't go as far as saying that this is the best Porcupine Tree album ever. The fact is, that because each PT album offers something different from the last, my favorite one is entirely dependent on what my mood is at the time. But In Absentia is definitely the Porcupine Tree we know and love, as they continue to be one of the brightest lights on the modern rockscape. Visit Porcupine Tree at their web site: http://www.porcupinetree.com.